Raw 76 for Cats and Kittens. Cats and kittens love our fresh balanced raw meat diet. Compared to dogs, cats are generally uniform in size and dietary requirements vary little. Requirements of kittens and adult cats are very similar, so there is one formula for all ages. It contains a natural balance of meat and vegetable matter, rich in taurine, vitamins, minerals and trace elements. 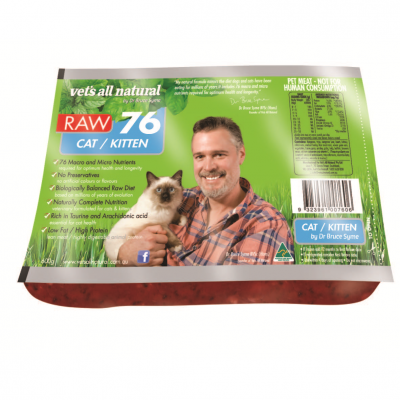 The meat ratio in the Raw76 Cat/ Kitten variety is higher to match their naturally high carnivorous requirements.